Rub a Dub Dub, Three Men (Actually 62 Greyhounds) in a Tub! Yes, I said 62 greyhounds, actually 62 beautiful greyhounds. My very good friend, Kim LeVear, came up with the idea to get a few volunteers together and carpool over to Birmingham Race Course to wash all the greyhounds in the Southern New England Kennel, belonging to Alan Olson. Kim scouted and emailed several folks who had adopted their Southern New England Greyhound through Southeastern Greyhound Adoption, although this was not an official SEGA activity. Most were very willing to commit to the project. In the end, we had 10 volunteers who made the trek over to Birmingham this past Saturday afternoon. We all met at the Park and Ride off I-20 in Villa Rica, Georgia. Once the introductions were complete, we determined who would ride with whom and off we went. After all was said and done, there were three vehicles making the trip over. We arrived in record time (about an hour later) only to find that Alan nor his wife, Linda, were at the kennel. Yikes! We stood there chatting and waiting and soon enough Alan and Linda pulled up in the hauler filled with dogs who had just run in the matinee. After they had pulled all the dogs off the hauler, cleansed their eyes, squirted their feet with Betadine, handed them their “treat” and put them back in their crates in the kennel, we then started organizing the dog wash, preparing the flea shampoo, getting hoses in the right spots, etc. Then the work commenced! Alan would let 10 or so dogs at a time into the “wash area”. Once they were washed, they came to the “rinse area” where they had to sit 10 minutes or more with the flea shampoo on them. After that time, they were rinsed with cool, fresh water. Then it was on to the “drying area” where they were allowed to air dry in the afternoon sun. The dogs kept coming and coming and everyone continued with the flow of things – washing, waiting, rinsing, drying, moving dogs from one turnout pen to another to get to the right “station”. Several times during the afternoon we asked Alan if he had been grabbing dogs from the kennel across the street because it seemed we must have washed 80 or so dogs by then. Each time, he’d tell us “only 15 more”. We took advantage of the cold sodas and cold water Alan had on hand for us to drink as it was pretty hot that afternoon and we were doing this in the afternoon sun, as you can see from the photos. We finally neared the end (for sure this time), and then it was more of a waiting game while they continued to dry in the afternoon sun. Once dried, everyone was returned to their respective crates. Whoo hoo! We were10 very tired and dirty, flea soap smelling folks. A few of us had decided prior to this that we would stay at the track that evening and grab some dinner and watch a few of the night races so we came prepared with a change of clothes. Alan secured us a complimentary sky box which was really nice. We each changed clothes in the kennel bathroom and everyone scrubbed down with Baby Wipes! Nothing like a Baby Wipe bath after an afternoon of washing that many greyhounds! 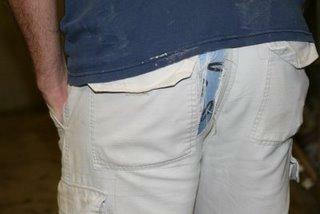 Oh, the picture below is that of one of the volunteers, Scott, who obviously bent over one too many times! Hilarious and thank goodness he had underwear on! What fun we had though! I think Kim mentioned wanting to do this again in the fall while it’s still warm outside. I believe all the volunteers expressed an interest in doing it again and all were very happy they had volunteered. 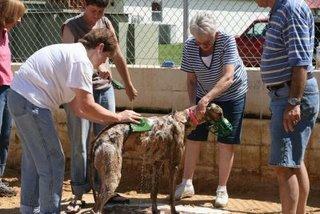 What a great feeling knowing we helped 62 Greyhounds in a 3-4 hour period. I spoke with Alan on Sunday and he said to me, “Those dogs look like show dogs”. They probably feel like it too! Now, that’s a nice feeling, for sure. 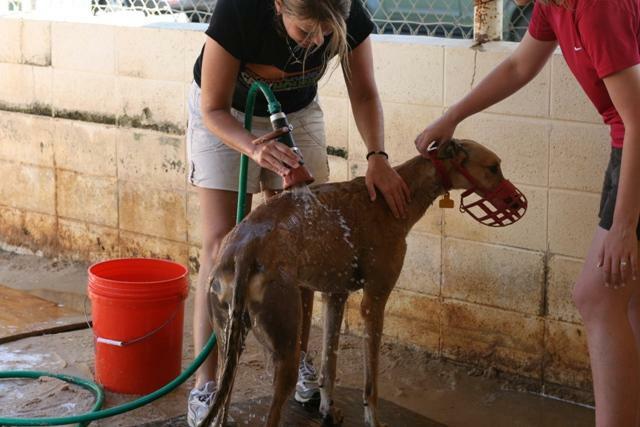 To continue what is believed now to be an annual event, Kim LeVear arranged another dog wash this June at Southern New England Kennel at the Birmingham Race Course. This time, however, it was an official activity of a new greyhound adoption group called Second Chance Greyhounds, http://www.secondchancegreyhounds.org. Southern New England Kennel is supplying greyhounds for Second Chance Greyhounds, so we have sort of adopted Alan, his wife Linda, and their greyhounds because they are simply “good people” who care about their greyhounds and who take very good care of their greyhounds. Alan WILL NOT put a greyhound down unless there is an injury that is irreparable and the greyhound is in a great deal of pain. Then, of course, it is the humane thing to do. I’ve seen him hold onto a dog for a year or so while waiting for an adoption group to take it. He’s just like that! Kim again emailed folks who she thought would be interested in participating, and we also notified Second Chance Greyhound members and new adopters. In the end, we had 9 happy and willing folks volunteer to help out! Whoo hoo! Again, we met at the Park and Ride off I-20 in Villa Rica, Georgia. Everyone determined which vehicle they would ride in and as in the year before, we had three vehicles make the trek over to Birmingham, all loaded with happy volunteers. We arrived around 12:30 p.m., CST. Alan and Linda weren’t there but we called and they soon were on their way to meet us. The matinee races start at 1:30 p.m. so they had some time to spare and had gone home to eat lunch. Upon arrival, introductions were made and then Kim and I commenced to photographing the new batch of greyhounds who will be the first five for our group to go into the prison foster program. The photos took some time but we did have the help of quite a few volunteers who made the whole process go a lot quicker. 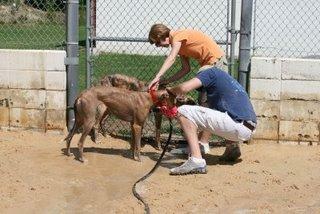 After photos were complete, we started the dog wash. Alan again would bring out 10 or so greyhounds at a time. They would get washed, then would move to the wait/rinse area and then to the drying area. Most were very good while allowing us to bathe them. Some didn’t care much for the water hose, but they did tolerate it for the few minutes they were getting rinsed. For most, it was probably the first bath they had ever had. And definitely, all were very appreciative – you could see it in their eyes. 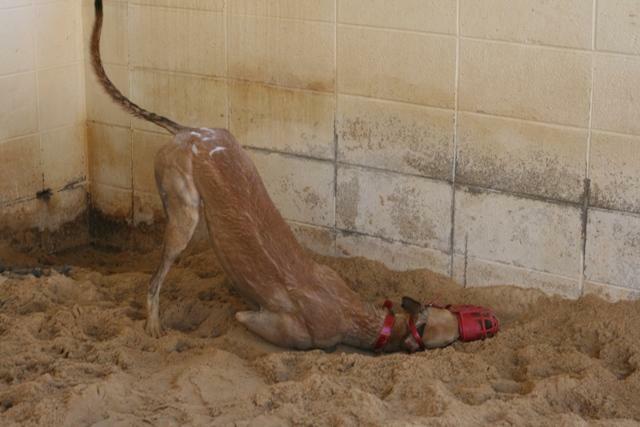 As dogs typically do, quite a few would roll in the sand after their wash and even after their rinse. They looked like sugar cookies! Hours later we finally bathed the last few racers coming in from the matinee races and then the two that we were bringing home with us, Crenshaw Flossie and Oakland Saturn. We cleaned up, changed clothes, did the baby wipe bath, and then to the grandstand to watch a few races and have dinner in our skybox Alan had secured for us. We only stayed for about six races because we needed to gather Flossie and Saturn and head back to Atlanta. I believe I walked into the door close to midnight after leaving that morning around 11 a.m. What a long, long, day! Needless to say, my four greyhounds were very happy to see me. Even as long as the day was and as tired as everyone was, I think I can vouch for the whole group and say that participating in the dog wash every June has got to be one of the most fulfilling activities that we do as a group. The dogs appreciate it and The Olson’s really appreciate it. It’s a win-win all around!! We are very much looking forward to the wash next year! An added bonus, we have an entire year to rest!